Super Cleanup is described as a computer optimization program which does not fulfill its promises. This tool was created and developed by a company, known as Jawego Partners LLC. The software has its official page in which it claims to be able to clean all Windows Registry errors and provide a big variety of other functions that increase the system's performance. However, all of this information is supposedly false as it is only an advertising trick used to promote this type of software. All that Super Cleanup does is imitating a full computer scan and providing a list of various errors found. Once problems are detected, the program offers to buy its licensed version in order to clean the system and repair all the damage that has been done by various flaws and threats. It even offers a 60-day money returning guarantee! Sadly, all of these claims appear to be just a part of the tool's promotion and users who decide to purchase the license key are very likely to encounter no changes in their system as there were no similar errors in the first place. 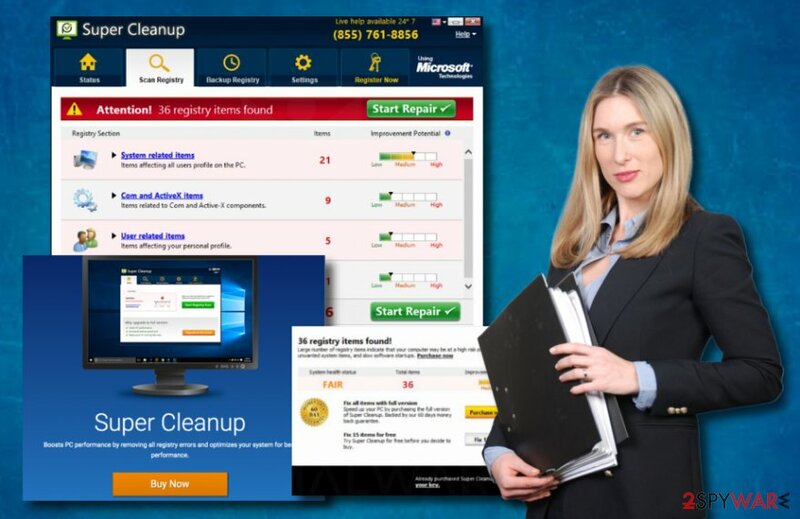 Super PC Cleanup, Advanced PC Tuneup, Advanced Clean Pro, Lowe Registry Cleaner, etc. Rogue system optimization software such as Super Cleanup is a beneficial source for many developers. However, there are a lot of similar applications lurking in the cyberspace and tricking users by providing “useful features”. 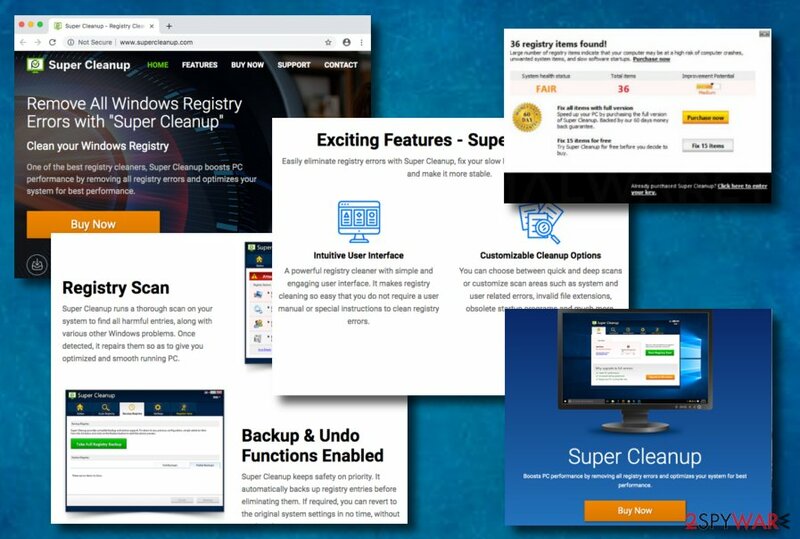 Examples of similar tools: Super PC Cleanup, Advanced PC Tuneup, Advanced Clean Pro, Lowe Registry Cleaner. Super Cleanup virus can be called that way as it is distributed not only on its official website but also it can be secretly installed on the computer system through bundled programs. You need to know that no reputable and trustworthy software will perform a stealth download on your computer system and start performing activities without your notice. Super Cleanup can launch various pop-up notifications that might interrupt your computing work due to the frequency of these ads. Mostly, the program bombards warnings about various infections and errors found while all these suspicious flaws are only cache and outdated registry entries that the program has gathered and presented as dangerous threats. You might be attracted to the big variety of features that the program claims to provide. However, do not rush to pay the price needed for the license key. Better choose a reputable tool, e.g. Reimage and scan the system for real threats. You should also remove Super Cleanup from your computer system and prevent the intrusive notifications form bombarding your screen. The fake system optimizer is no good for your computer system as it only takes up some space that you could use for a trustworthy antivirus application. Super Cleanup removal is the best option you can make. Additionally, by removing the application, you can scan your entire system and detect real possible threats and flaws. Tech experts from NoVirus.uk website claim that computer optimization software usually has its own website for promotion. These pages are created with a legitimate look and shout out the supposedly beneficial features that there offered product will bring to the user. This type of marketing technique gives beneficial results quite often. We recommend keeping a distance from these pages and trying not to fall for their tricks. In some other cases, various misleading applications can be distributed through regular software, known as freeware or shareware. Bundled programs sometimes included additional content which might appear to be an adware app, for example. Avoiding this secret installation is truly possible. What you have to do is never lack cautiousness while browsing the Internet and especially while performing downloads on your own. We suggest using the Custom or Advanced configuration for completing your downloads as here you will be able to manage which objects to install and which ones not. There is plenty of trustworthy programs that can be handy and do the system optimization job very successfully. So, there is no need for keeping questionable tools on your computer system which take only space in your disk. Super Cleanup virus is one of the suspicious-looking system optimizers which do not bring true value for the users and their computers. Remove Super Cleanup from your Windows or Mac machine and get a reliable program rather than having this one. You can choose from a big variety of tools but make sure to pick one that truly suits your needs. However, all of these tools need to be updated regularly to ensure that they are operating exactly as they should. Talking about the SuperCleanup removal, there are two different ways to achieve such goal. You can use reputable anti-malware and get rid of the program with this software's help or you can use our below-provided step-by-step guide. Note: do not forget to check your web browser applications as they also might contain adware-related content. Here, look for Super Cleanup or any other recently installed suspicious programs. Wait until you see Applications folder and look for Super Cleanup or any other suspicious programs on it. Now right click on every of such entries and select Move to Trash. When in the new window, check Delete personal settings and select Reset again to complete Super Cleanup removal. Once these steps are finished, Super Cleanup should be removed from your Microsoft Edge browser. Here, select Super Cleanup and other questionable plugins. Click Remove to delete these entries. Now you will see Reset Firefox to its default state message with Reset Firefox button. Click this button for several times and complete Super Cleanup removal. Here, select Super Cleanup and other malicious plugins and select trash icon to delete these entries. Click Reset to confirm this action and complete Super Cleanup removal. Here, select Extensions and look for Super Cleanup or other suspicious entries. Click on the Uninstall button to get rid each of them. Now you will see a detailed dialog window filled with reset options. All of those options are usually checked, but you can specify which of them you want to reset. Click the Reset button to complete Super Cleanup removal process. ^ NoVirus.uk. NoVirus.uk. Spyware news web page. ^ Margaret Rouse. Freeware. What Is. Tech Target. ^ What is System Optimization. IGI Global. Dictionary. This entry was posted on 2019-04-14 at 06:56 and is filed under Adware, Viruses. You can quickly scan the QR code with your mobile device and have Super Cleanup manual removal instructions right in your pocket. How did you remove Super Cleanup?